In my last post, just about four weeks ago, I valued Tesla, and as with all of my Tesla valuations, I got feedback, much of it heated. My valuation of Tesla was $186, in what I termed my base case, and there were many who disputed that value, from both directions. There were some who felt that I was being too pessimistic in my assessments of Tesla's growth potential, but there were many more who argued that I was being too optimistic. In either case, I have no desire to convert you to my point of view, since the essence of valuation is disagreement. 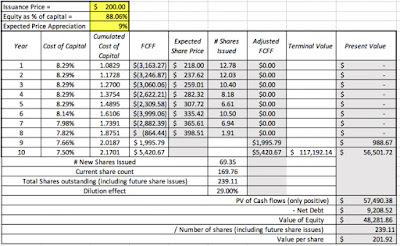 In the context of some of these critiques, there was discussion of how my valuation incorporated (or did not incorporate) the expected dilution from future share issuances and what share count to use in computing value per share. Since these are broader issues that recur across companies, I decided to dedicate a post entirely to these questions. 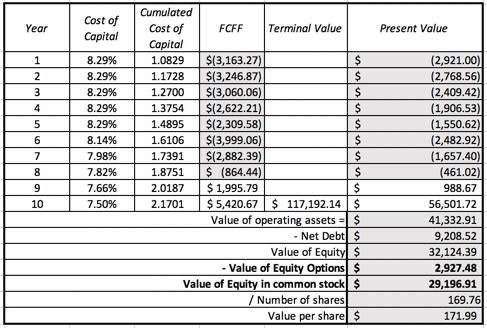 Implicitly, I am assuming that the firm will fund 88.06% of its capital needs with equity, consistent with the debt ratio that I assumed in the DCF, and that the shares will be issued at the intrinsic value per share (estimated in the valuation), with that value per share increasing over time at the cost of equity. That may strike some as unrealistic, but it is the choice that is most consistent with an intrinsic valuation. 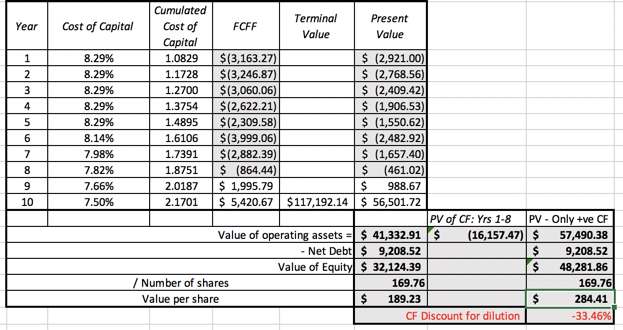 If Tesla is able to issue shares at a higher price (than its intrinsic value), we will have under estimated the value per share, and if it has to issue shares at a price lower than its intrinsic value, we will have over estimated value. There is one final reality check. While we have implicitly assumed that Tesla will have access to capital markets and be able to raise capital, there is a chance that capital markets could shut down or become inaccessible to the firm. 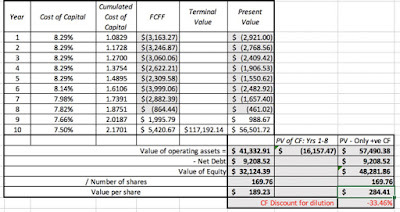 That risk is not in the discounted cash flow valuation and has to be brought in explicitly in the form of a chance of failure. In my base case valuation, it is one of the reasons that I attached a chance of failure (albeit a small one of 5%) to the company. And Nonsensical Practices: There are two woefully bad practices, when it comes to stock based compensation, that should be avoided. The first is to just adjust the share count for options outstanding and make no other changes. 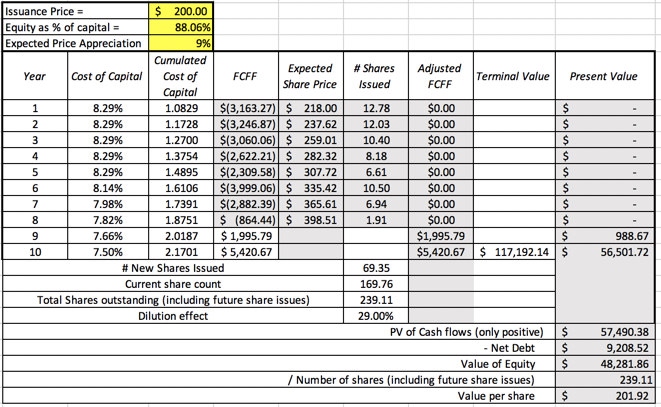 In this "fully diluted" approach, you are counting in the dilution that will arise from option exercise but ignoring the cash that will come into the firm from the exercise. Don't use SBC adjusted earnings: Adjusting earnings and EBITDA, by adding back stock based compensation, is an abomination, used by desperate companies and analysts to show you that they are making money, when they are not even close. Don't fall for the sleight of hand. Twists and Turns in the Tesla Story: A Boring, Boneheaded Update!